Make sure you head downtown to Providence August 20-23 for the citywide celebration of H.P. Lovecraft&apos;s 125th Birthday. NecronomiCon Providence is the world&apos;s foremost celebration of author Howard Phillips Lovecraft (and his influence) right here in the hometown he loved. The amazing part of this celebration is the opportunity for Lovecraft fans that might not be able to attend the convention to enjoy four days of public events at a very nominal price. Here are 10 ways to say, "Happy Birthday, H.P.!" 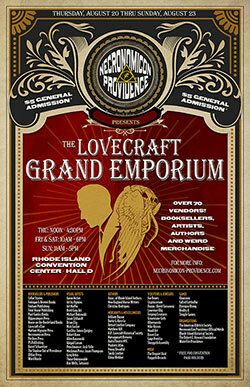 1) Lovecraft Grand Emporium, August 20-23 at the Rhode Island Convention Center. Stunning array of more than 60 vendors from all over the world, featuring the best booksellers, publishers, print artists, sculptors, jewelers, and general purveyors of top-tier weird. Daily hours vary each day and the admission fee is $5. 4) Ars Necronomica Print Exhibit at Julian&apos;s on Broadway. Fans have the opportunity to purchase print pieces after viewing the samples at the restaurant. Exhibit runs August 20-23. 6) Daily Film Screenings - from August 20-23 - will be a combination of Lovecraft inspired feature films and short cuts, open to the public for $5 daily between 10 a.m. -1 a.m.
7) Live Theater Performances - from August 20-23, including an exclusive script reading of the TV pilot "NecronomiCon" currently being pitched. Open to the public for $5 admission, schedule online. 8) The Rhode Island Historical Society will be offering a special H.P. 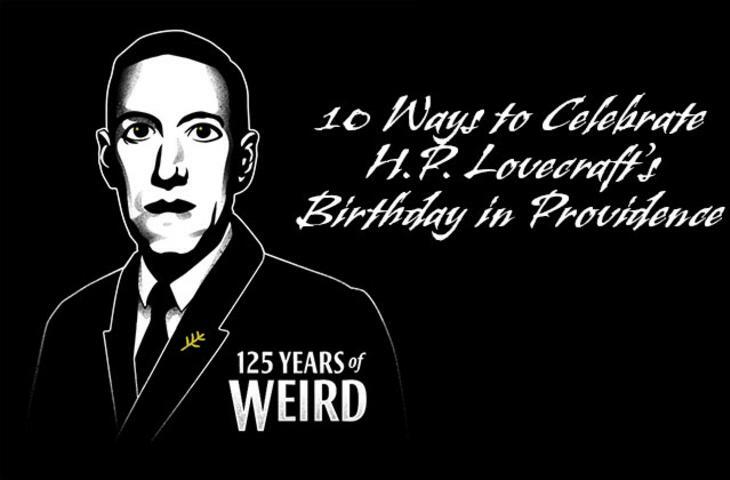 Lovecraft Tour commemorating his 125th birthday on Saturday, August 22 at noon. The tour admission fee is $10 and will depart from the John Brown House. Reservations are highly recommended and can be made by contacting bbarnes@rihs.org. 9) A Columbus Theatre Concert on Saturday, August 22 includes the following musical acts: Earth, Elder, Assembly of Light Choir, and Owlfood. The concert begins at 9 p.m. with a $20 ticket price in advance or $23 at the door. 10) Sunday evening at the Columbus Theatre will bring a Rocky Horror Picture Show-style send-up of the 1970 film, "The Dunwich Horror." The event will feature a live band, stage actors, audience participation and, of course, lots of weirdness! The show starts at 9 p.m. with a $5 admission fee. Lastly, don&apos;t forget to check out the Lovecraft store open in the historic Arcade Providence, located at 65 Weybosset St. To view the complete schedule and lineup of events go to necronomicon-providence.com.